Clicking on Add New Reward you will be adding days where users will be able to earn something. On every reward of a calendar, you can set an image and a label you want. 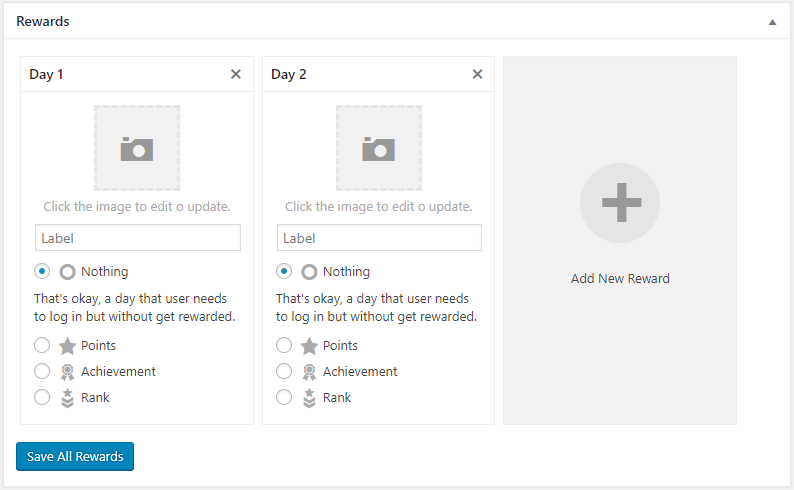 Also, when you choose the reward type (described below) you are able to set as reward image the image configured on the points type, on the achievement or on the rank (depending of the reward type you chosen). Set a reward as nothing will make a day that user needs to log in bit without get rewarded for that. This option will be useful in combination with the consecutive log in option to force users to log in some days without any reward and rewarding the last day with a high reward. Checking this type will let you reward to the user with an amount of points of any points type for log in this day. Checking this type will let you reward to the user with an achievement for log in this day. Checking this type will let you reward to the user with a rank for log in this day. Note: The rank just will be awarded if user is in a lower priority rank than the awarded one. Every time an user earns a new reward, this action will trigger the activity events registered by Daily Login Rewards to let you award your users for perform them. Also, there are activity events from completing a rewards calendar, so you will be able to set the rewards calendar completion (of one or multiple of them) as requirement to get awarded/deducted with points, unlock an achievement or reach a rank.